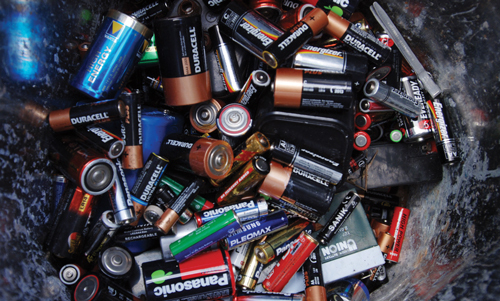 We've all got a drawer of them at home, but how are batteries recycled? 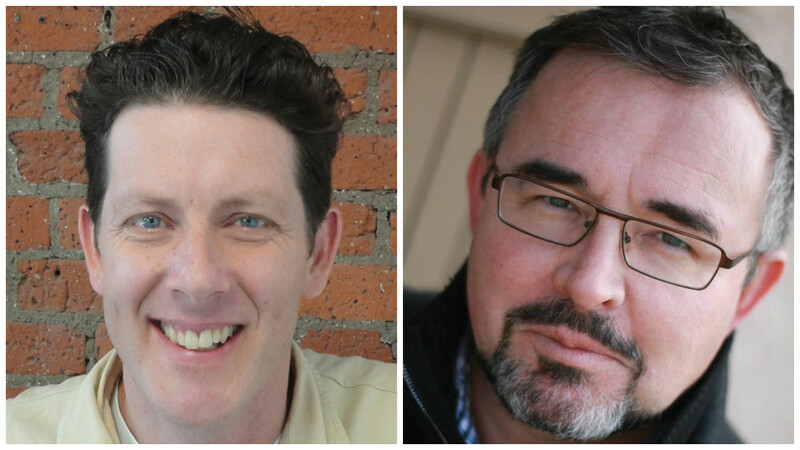 We asked Nick Purser, Communications Manager, and Mario Champagne, Chemical Process Engineer, Technical and Audit Manager at ERP. How common are the various types of portable batteries and what are they used for? Non-rechargeable and rechargeable portable batteries have many different chemistry types. The most common batteries are alkaline/zinc-carbon batteries, which can be found in most handheld electronics. Rechargeable batteries, such as nickel cadmium, nickel-metal hydride or lithium-ion/polymer batteries, are also used to power handheld electronics, as well as mobile phones, laptops, and power tools. Lead-acid batteries are most commonly found in big electric toys, motorised wheelchairs, portable tools or on boats. Non-rechargeable lithium batteries are less common but can be used, for example, in remote locking systems for cars. Button cell batteries (mercury, silver-oxide and zinc-air batteries) are most commonly used in very small devices. The 2015 data (right) comes from one of the collection/sorting companies used by ERP in the UK. 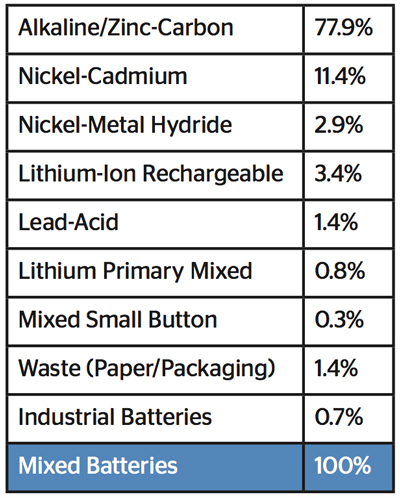 It clearly shows that alkaline (single-use) batteries are the most commonly collected (almost 80 per cent), followed by nickel-cadmium (rechargeable) batteries. What happens to the different battery streams following collection and sortation? After collection, batteries are sorted manually and automatically by chemistry type. With efficiency levels of 98 per cent, automatic sorting has become very sophisticated in the last few years. The sorted batteries are stored and carefully identified to avoid further mixing. Lithium batteries need to be handled with care as arcing can occur if the batteries have any residual energy. That is why those batteries are layered in dry sand or vermiculite. Where and how are they reprocessed? Lead-acid batteries are treated in the UK by the same smelters that process end-of-life car batteries. The batteries are crushed to recover the sulphuric acid, plastic and metal; lead is recovered in lingots to make new car batteries. All the other types of batteries are exported to Europe because there are no treatment facilities in the UK. Each battery type goes to a facility where they can recover the valuable materials and capture any pollutants and heavy metals. The shipped loads are sorted again to reduce contamination. Alkaline/zinc-carbonbatteriesare shredded to separate the paper, plastics and metal from the black mass core. Mercury batteries are heated at high temperature to evaporate and condense the mercury further. Nickel-cadmium, nickel-metal hydride and lithium batteries are processed at high temperatures in thermal vacuum vaporisation units, where the precious metals are evaporated and then condensed. What secondary materials are recovered from the different types of batteries and what applications can they be used for? The iron in all battery types is recovered to make new goods. The manganese oxide inside alkaline batteries is processed in a rotary kiln to recover the zinc oxide, which can be used as an additive in numerous products including plastics and ceramics. The cadmium recovered from nickel- cadmium batteries is used to make new batteries. The nickel in nickel-metal hydride batteries is recovered to make steel. Cobalt, nickel and copper can be recovered from lithium batteries. Mercury is recovered from mercury cell batteries and the decontaminated steel fraction is used to make steel. Have there been any important recent developments in battery recycling? Given the importance of critical raw materials (CRMs), research and development teams are developing processes to extract CRMs from batteries. Some recycling companies in Europe are looking to develop ways of separating manganese and zinc metals from black mass by electrolysis, but this procedure is still costly. Others have developed ways to avoid shredding and separate the anode and cathode parts of batteries quickly and easily. Finally, studies have shown that it may be possible to transform the black mass from alkaline batteries into fertilisers, but doubts remain about the presence of heavy metals in the final product. Stakeholders are being asked to respond to a consultation on changes to the producer responsibility schemes for batteries and packaging, and submit evidence relating to a review of recycling targets. G&P Batteries has installed Europe’s ‘first automated optical waste battery sorting system’. Defra has changed the definition of a ‘portable’ battery to one under 4kg, rectifying a ‘grey area’ in reporting but increasing costs of compliance for producers. Veolia has agreed a long-term contract to provide recycled glass to Knauf Insulation, which will be processed at a new £10-million facility.